You are right Greg, there are a lot of nice pole arms examples on Hremann Historica's web site, but the vast majority of them do not fall within the period of discussion (13-14c). One of the reasons I started this thread is because there are not a whole lot of surviving pole arms from that period (as compared to 15c and later), and even smaller number are being reproduced. Finally found the pics I had mentioned to you. Here are two. The artist did several all in the same vein. The detials for the first pic. The second pic is by the same artist but different pic in the series. The weapons that stand out are the "sparth axe" like ones on each pic. Are they "sparth axes"? They also look a lot like the the XIVc staff-weapon from Czerny's that I posted picture of earlier on this thread. In a gallery of pictures from the Royal Armouries, I saw another like that. No info though on what they were called, or who used them. The nomenclature used by any group of individuals in any time period for a specific weapon is almost unknowable in most cases. There are not catalogs of weapon types from the period with illustrations and descriptions. There are several inventory lists from armouries and castles and such. This is why we have the group of terms we use today. Wether we have correctly id the weapons and that this was a common general name for them is far from certain. Such pieces as bills, halberds, axe, spear are I think very stable terms. The more regional and Colloquial the terms get the more difficult it becomes. I would say these items are definitely in the development of what we refer to as Sparth Axe, but wether those soldiers carrying these items in the painting addressed them as such in the early 1300's I would be leary of anyone who claimed such with out a nice research paper behind it. In fact one of the elements that our modern minds have difficulty factoring into such discussions is that a group of individuals , being soldiers of medium or low rank and on campagne almost certainly referred to their weapons in "colorful" and individualistic ways beyond our imagination. Which of these stuck and became popular we do not know. It is the same in any such human endeavor, from the Norse names for their weapons to the pilots and tank drivers in todays army and airforce. The men how use the item are often the ones who find its true name not the designer or makers. This would probably be a very interesting field of study all on its own! Very Best and thanks for the great pic. "Such pieces as bills, halberds, axe, spear are I think very stable terms. The more regional and Colloquial the terms get the more difficult it becomes." I think Craig has hit the nail on the head. In a sense of general forms, you have the bill (descended from the Agricultural billhook or scythe on a stick), the glaive (knife on a stick), the axe or halberd (hachet on a stick), and the spear (point on a stick). The polearm didn't really gain momentum until the end of the 14th century, which is why you're finding so few examples. The earlier examples of all these forms are very simple, and throughout the 15 and 16th centuries they became more elaborate. In general, all of them developed top spikes and then back spikes and finally a slimming down into art works more than tools. They are a footman's tool, not the Knight's, although the Knights did have their poleaxe as part of their standard repetoire through the 15th century (small axe head, ~3 inches, and usually a hammer on the back side, although some had a spike). 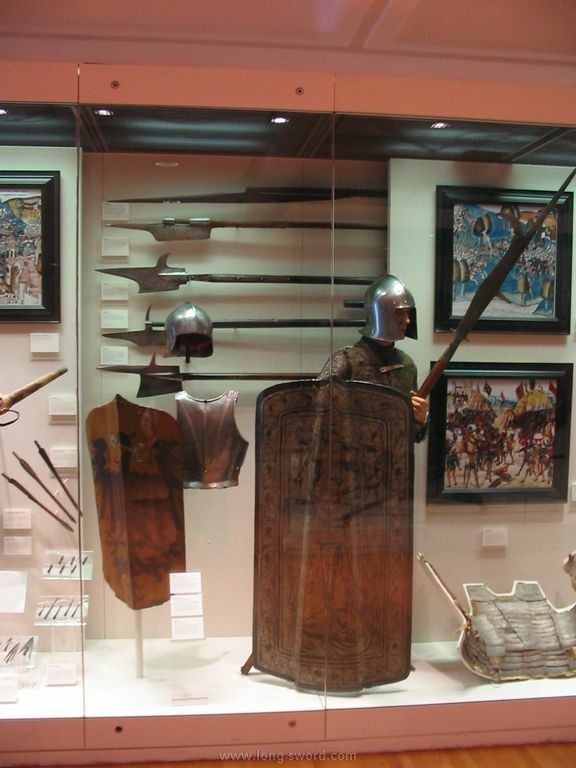 As far as the photo you have from the museum (the one on top), and the Sparth Axe, I've never come across that term before, but I have seen a weapon of very similar form from Scotland being called a 'Jedburg Axe'. I'm pretty comfortable with calling this weapon a Glaive in the general sense, although it definitely could have been a departure from a Bardiche (closer to an Axe). As far as the weapons' dimensions and scale, most polearms are mounted on square or rectangular shafts, and if you've handled heavy blades on a round pole, you'll know why. When you swing it, the weight of the head and intertia cause it to swing around in your hands. Most are between 6 and 8 feet tall, and weigh in around 4 pounds or so. A Steel or Iron buttcap or band help counter balance the weight of the heads (not to mention serve as an aspect of the weapons 'fight'), and while maybe a bit heavy to the hand, a properly made one will be very nimble and agile if you have the strength to move that much mass. The windlass polearms are fairly pathetic attempts at general forms, and since time and region did play a lot into their designs, Windlass opted for general 'ish' profiles. A+A has done a great job of reproducing historical arms, and their polearms are no exception, but I tend to actually bang these things up (polearms), and won't waste the money on something that's going to get trashed. I would add some non-bladed peasant weapons which are a little less well known, but were probably very important at the time. These would include the two handed threshing flail converted for war, which seemed to be very ubiquitous in every peasant uprising and militia levy from the middle ages to the renaissance. Then there is the so called gudendag, or guden tag, a sort of two handed combination spear / mace used in flanders against French knights in (I believe) the 14th century . That weapon is kind of a natioanlist symbol for flemish independence. Finally the morganstern of Germany, which isn't a morning star in the sense of just being a spiked mace, it's a two handed thrusing spear with a cluster of spikes all over the head, allowing it double duty as a mace. Osprey just came out with a pretty good book on the hussites, who I have found hard to find out informaion on. I'd completely forgotten about the Flail family, thank you. Now I'm just smiling over the idea of a weapon called "Good Day". ..
On the faire circuit we've often referred Hammers and Axes as "...a useful tool for cracking open the shells of those shy Englishmen...", but the 'Guten Tag' clearly needs to be added to the Arsenal now. Do you by chance have any photographs of any that wore that specific moniker? I wouldn't call the Windlass attempts pathetic. The English Bill, French Voulge and German Voulge were all very good (that is nimble, accurate,and tough). Would be totally cool. Thank you. Note that the only the heads are MRL/Windlass. Hey Alexi, thank you for initiating this very interesting topic, of course there is not any knowledge I can add to it but there is a lot of learning for me to get from this. Sean, the halberd by Windlass the Voulge, I think it is called, I have been eyeballing that for a couple of months now and was inspired by what you had to say about it's construction and balance. I had been aprehensive about it because I wondered about the quality, but now since having read your first hand impression about it, that clears it for me for the go ahead to acquire it, maybe I will ask my wife to get it for me for Christmas or something, because I just bought the Danish War Axe from A&A and having spent $5,000.00 or so on weapons and books since July, I agreed to not buy anything else until next year. I guess some of the items like axes, polearms etc made by Windlass are pretty decent. I bought a biter made by them and I gotta say I was very impressed and surprised at the quality for $109.00. Alexi, once again thank you for bringing this topic up! Well if your wife goes for it she's a keeper. HMMMMMMMMM: Let me follow your reasonning. " But dear, I promised to not buy anything more until next year ! YOU would be buying this for me for Christmas. Sorry Bob for teasing you but one does have to admire your nerve ! Now everybody back to topic ! • Originals of this type seem to be significantly longer than MRL's. I forget now what lengths I was seeing but I seem to recall that they were in the 6'-7' range. Of course, those may have been rehafted. This is a tricky weapon to place, lengthwise, because it has features of both the poleaxe and the halberd. 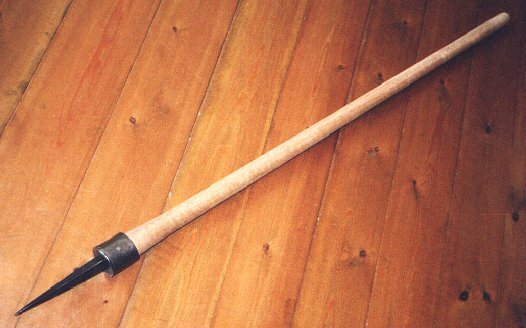 MRL's length may be historically feasible, as its a good length for a poleaxe. • The blades of all the originals I've seen have a pronounced "belly," which is to say that the blade is much broader at its base than at its upper end. The MRL piece, by contrast, has more mass in its upper portion. • The blades of all the originals I've seen terminate in a straight point (parrallel to the haft), while MRL's curves slightly backwards, somewhat restricting ability to thrust. • The MRL blade is pinned to the langets (and haft?). In at least one original, the langets and socket are of one piece and the "tang" of the blade passes through socket and haft and is peened its full length where it emerges on the other side of the socket. I think these issues are in line with what we see in MRL's historical swords. I wouldn't accept them in a more expensive weapon, but I think they're at least within the realm of historical possibility. I really love the look of this weapon, though I'd like to experiment with rehafting it. If you can still find an MRL Swiss Axe, I think that's a better bargain. Still....what a wicked-looking weapon! should be shipped in a week or two now from what I understand and Wow am I excited to see it! These are based on images from the Maciejowski bible. You can check out his website at www.manningimperial.com. I've felt that glaive thing, it was actually quite well balanced and an interesting weapon. The only other polearm from the 13th century I can think of the bill, however I think that at this stage it was simply an agricultural bill hook on a longer pole, that may have had a thrusting point attached.